This season is an especially busy time of the year for several reasons: private lessons are wrapping up, school band season is starting up at St. John’s Music, school is almost out, Jazz Festival is getting underway, etc…Sarah and I held our final studio recital for the year on Sunday June 3, which was fantastic! We are very proud of all our students and what they have accomplished this year. One of my favourite events that takes place in June is the Strata Festival of New Music, which commenced its seventh year on Friday, June 2 with an opening reception and performance from Ontario-based sound artist, Gordon Monahan. Sarah and I had the pleasure of getting to know Gordon while he stayed at our place for most of the week before his event. His sound installation is currently on display in the Riverview room of the Remai Modern gallery for the next couple of weeks. The materials for his sound installation consist of piano wire and motors which generate frequencies that are converted to sound, played through four speakers. I won’t bother explaining the finer details of how his installation works (nor will I do justice of explaining what is really happening with the installation), but I strongly suggest you go check it out – if you haven’t been to Remai Modern yet, now is the perfect time! The main events of the Strata Festival this year include three unique concerts and one composer talk from June 8-10. The evening concert for Friday June 8 will take place at the Roxy Theatre and features four short films from Canadian directors with live film scoring by Canadian composers. Regina’s Helen Pridmore is the guest performer for this concert. The Saturday evening concert will take place at Remai Modern and features four performing groups that will present their music in response to Gordon Monahan’s sound installation. I will be performing my new composition for saxophone and electronics at this concert (Saskatchewan Suite). Since my performance in March at the saxophone conference in Cincinnati, I have composed a third movement that I am excited to say experiments with my looper pedal. 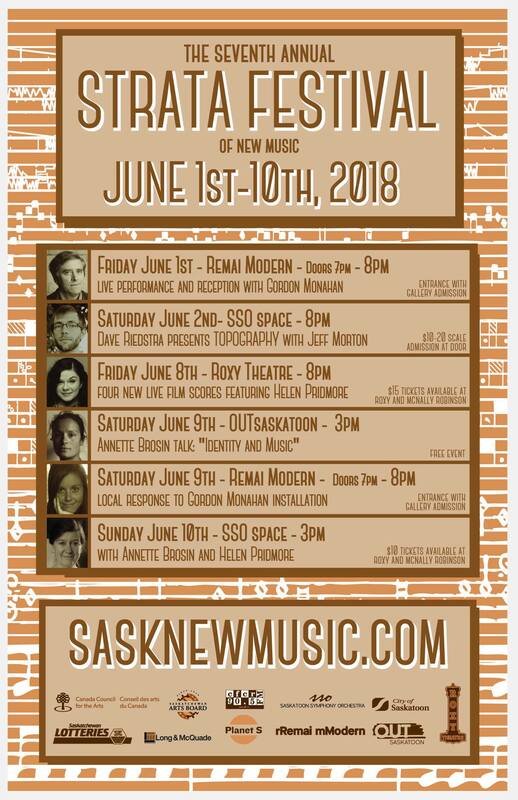 Also taking place at 3:00pm at the Saskatoon Symphony Office is a composer talk with the second Strata Festival featured composer, Annette Brosin. Her talk is titled “Identity and Music,” which will be an engaging discussion for not only composers but performers as well. The Sunday afternoon concert at the Saskatoon Symphony office features new music from Annette Brosin and will harbour a more traditional chamber concert setting. I will be performing one of Annette’s chamber pieces in an ensemble of Saskatoon musicians.